Want to meet your favorite New Adult Authors? Win awesome prizes? Have a lot of fun? Yes? Cool. We want to meet you too. 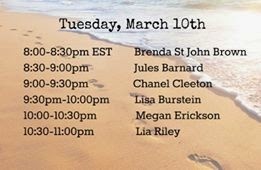 Join twenty-four amazing NA authors at our spring break FB party March 9th-March 11th, 8-11 pm. EST. The hosts for Tuesday, March 10th.